Care Instructions: Machine wash warm gentle cycle, do not bleach, tumble dry low, iron low, dry clean. The SmartWool Merino 150 Hoody is a lightweight (150 g/m2) merino wool layer. The fabric is 87% merino wool and 13% nylon and features Core Spun technology, which is merino fibres wrapped around a nylon core. The manufacturer indicates that this fabric should help regulate body temperature, offers natural UPF, should resist odours and wrinkles, and is durable. The hoody is part of the Lifestyle collection and has a style that is a little less “backcountry” than most of my base layers. The first thing I noticed about the hoody is that it has a V-shaped slit at the front of the shirt. It is surrounded by a placket and shiny white stitching. The placket joins with the edging of the hood to make a continuous edge. The placket is a double layer of fabric with no interfacing inside. The hoody has raglan sleeves which measure 67 cm (26.4 in) from neckline to cuff. The hem is slightly dropped, measuring 58 cm (22.8 in) at the front and 66.5 cm (26.2 in) at the back. The hem has a 5 cm (2 in) long slit (surrounded by a placket and shiny stitching again) at each side seam and a small sewn-on SmartWool logo on the left side. Inside the neckline is a colorful strip of elastic, and there is also a hang loop constructed from the elastic. The hood has a seam up the back of it. The hoody fits me as I expected. Although I was a size small on the bust measurement, I was a size medium on the waist and high hip measurements. There is a bit of extra room in the chest of the hoody (but not too much), but it fits well in the waist and hips. The shirt is long enough to completely cover my behind, so paying attention to that hip measurement was important! The sleeves aren’t binding on my arms, but the sleeves are a bit too long, coming down past the second knuckle of my fingers. When I pull the hoody down in the front, the slit at the chest comes a bit lower than I usually wear (unless I’m unzipping a top to get rid of heat), and the top of my sports bra was visible. However, after a few minutes the hood dragged the neckline back a bit and the slit wasn’t quite so revealing. The fabric feels a bit stiffer, or less soft, than some other merino layers I have used. I’ll have to see if that changes with use and washing. I took the hoody on a quick evening ski tour up my local mountain and found that it was comfortable and worked well for that short duration. I don’t typically have a hood on my base layers, but I tucked it underneath my top layer and didn’t notice it. This hoody seems to be designed to walk the line between backcountry and urban. The neckline design is the main factor in this, and it remains to be seen how I like it! Initial indications are that it should perform well in the backcountry, and I look forward to getting out in it. 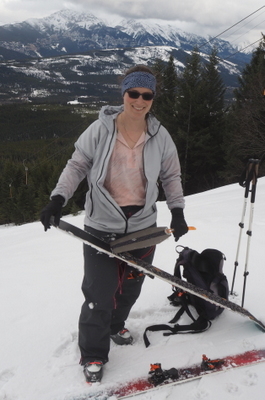 My field testing of the SmartWool Merino 150 Hoody started with a 3-day snowshoeing hut trip. 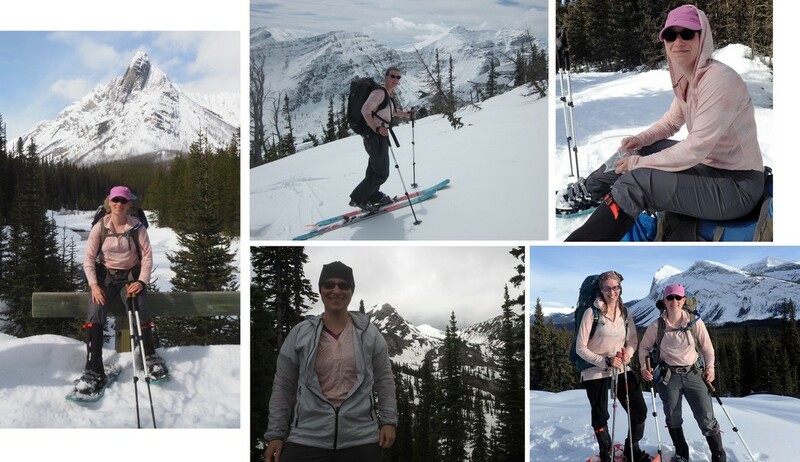 I wore the hoody as my base layer, and snowshoed between 14 and 17 km (8.5 to 10.5 mi) each day, at elevations between 1700 and 2200 m (5600-7200 ft). We had weather ranging from sunshine to wet snow, at temperatures within a few degrees of freezing. As my base layer, I have worn the hoody on two other days. One was a day of ski touring at about 5 C (40 F) in the sun, where we toured about 5 km (3 mi). The other was a day of geocaching, which involved small walks when it was about 10 C (50 F) outside. Additionally, I have carried the hoody on six day-hikes and one overnight hike. On the overnight, I put the hoody on in the evening after reaching camp and wore it for about four hours. I kept it on for the hike out in the morning, which was 6 km (3.5 mi) long. On the day-hikes, the hoody was mostly in my pack. I put it on at stops for breaks or at the summit for a bit of warmth, but didn’t hike in it most of the time. These hikes ranged in distance from 6 km to 15 km (3.5-9.3 mi) and temperatures were between 10 C and 20 C (50-70 F). I have washed the hoody ten times. Once was by hand in my sink, and the other times were in my normal laundry. I used regular detergent in a washing machine and then hung the shirt to dry. I have mixed feelings about the fit of this shirt. On one hand, I find the loose, long fit to be very comfortable and it easily slides on over other layers. On the other hand, I find the neck opening and hood to be extremely large. With the hood down, I have a large expanse of neck and chest exposed to sun and wind, and I’m a bit self-conscious in town, as bits of my underwear seem to always be showing. With the hood up, I just have a bit space at the chest, which can be seen in the photos above. The first day snowshoeing, I had the hood up during lunch, and found myself constantly reaching for a non-existent zipper at the neck to keep the wind out. The hoody has functioned well. While wearing it as my baselayer, it has been comfortable against my skin and done a good job of managing moisture for me. It definitely provides some protection from the sun, as I discovered on a day of ski touring. I had my sleeves pushed up, and I had sunburnt forearms and neck but nothing else. The shirt does acceptable at odour management. It seems to pick up initial odour on the first day, and then plateau at that level for a couple more days. Despite not loving the colour initially, I find myself liking it more over time. It works well with my colour scheme for hiking pants (grey/black) so works with everything. I still don’t like that it’s so see-through, though. The hoody shows no snags, pulls, holes, or fading yet. It has held up to being worn, stuffed in my pack, and washed with no signs of wear. The SmartWool Women’s Merino 150 Pattern Hoody has been a comfortable, functional layer so far. It is loose, soft, breathes well, provides some warmth, and doesn’t smell too bad. I find the neck opening to be very large, which doesn’t help conserve heat when I throw the hoody on as a layer for warmth. I may have chosen a size small if I’d had both to try on, but I can’t say for sure. I expect that the next two months will hold more days of carrying the hoody than wearing it full-time, but it will be in my pack as a long-sleeve layer in case I need it. Over the past two months, this hoody has spent a lot of time being carried around in my pack. The weather has been consistently hot, so I haven’t worn it while actually hiking at all. However, I have used it while resting on summits or ridgelines, around camp, and for sleeping while backpacking. 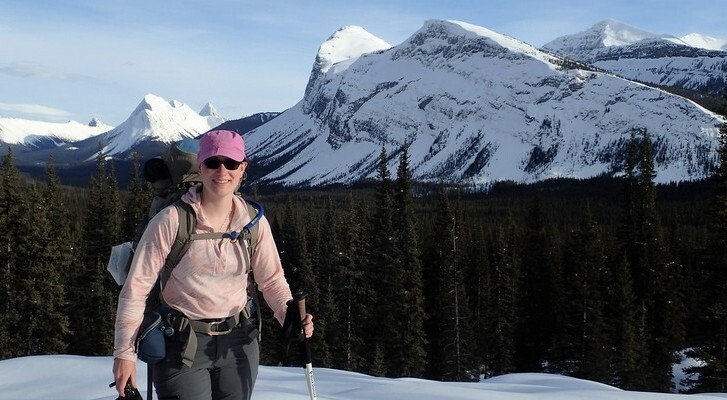 I have taken the hoody on one three-day hike, two two-day hikes, and seven day hikes. The days on the backpacking trips ranged from 8.6 km to 25.5 km (5.3 – 15.8 mi) long, and the day hikes were between 9.3 km and 20 km (5.8 – 12.4 mi) long. As I mentioned, the temperatures were hot: daytime temperatures have been up around 30 C (85 F), with overnight temperatures only dropping to about 5 C (40 F) at the coldest. The bulk of the time I’ve spent wearing the hoody the last few months has been in evenings and for sleeping. I have worn it to sleep six nights, with nothing underneath and no additional layers (other than my sleeping bag). I have washed the hoody eight more times. Twice was by hand and the rest in my washer with regular laundry. The hoody was always hung to dry. I continue to find this shirt a tad big for me. Without having tried on the size small, I can’t say for sure that sizing down would have been better, but this shirt still seems a bit big. I like the looseness of the shirt, but not the large space at the neck. I found this particularly noticeable while dressing for sleeping in it; there’s a lot of empty space with nothing underneath! The hoody has continued to be a functional piece. It was easy to stuff into my pack as a light layer for when I was stopped. It adds just a bit of warmth, though almost no wind breaking; enough that I was generally comfortable at lunch in it. I used it once to cover my legs while napping at lunch, and it was the perfect layer to keep a bit of warmth in and make me comfortable enough to fall asleep. While sleeping at night, I found it to be soft and comfortable. The hood wasn’t constricting when I had it up to sleep, but it still stayed on my head. My thoughts on the odour management of this shirt haven’t changed. It picks up some initial odour but the stinkiness doesn’t keep increasing, at least over the three days that I’ve used it before washing again. The hoody still looks really good! It’s surviving really well so far and I have no concerns with durability. I have enjoyed my test of the SmartWool Merino 150 Pattern Hoody. 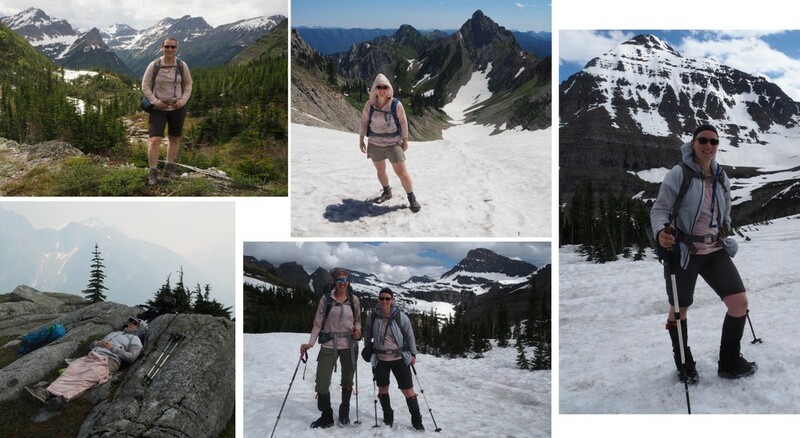 The shirt has been comfortable to hike, rest, and sleep in and has stood up well to use. I expect that it will remain in rotation in my hiking wardrobe for a while yet! Thanks to SmartWool and BackpackGearTest.org for the chance to test this hoody.